Creative Environments Landscape Co., Inc. Defined areas planted with a variety of goals in mind. Large and small, gardens add peace and tranquility to your home. Edible gardens are growing again in popularity. We have samples of formal vegetable gardens, along with blueberries and asparagus. Adding plant material to a project defines the look and feel for the entire property. 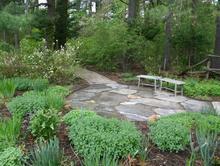 It can soften edges, formalize an area, create informal spaces, and bring warmth to a hardscape. Every environment requires specific attention to accommodate sun and shade conditions, exposure, and functionality. The samples below demonstrate a wide variety of situations and client goals. Spring bulbs are the first signs of life after the long winter. A well planned display can add a burst of color to greet the season.